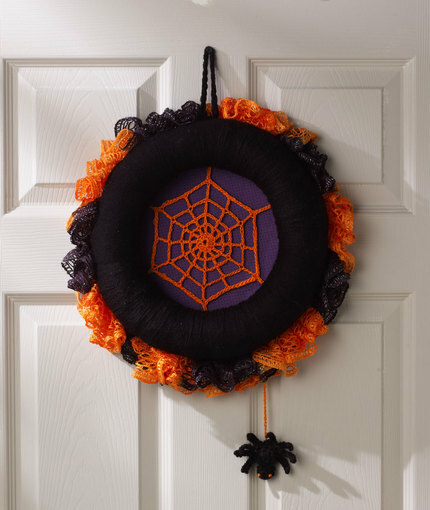 Create a stylish wreath to greet trick-or-treaters or decorate for a party. Our Sashay Team Spirit conveniently comes in an orange/black combination that is perfect for Halloween decorating! Web and spider are easy to crochet. 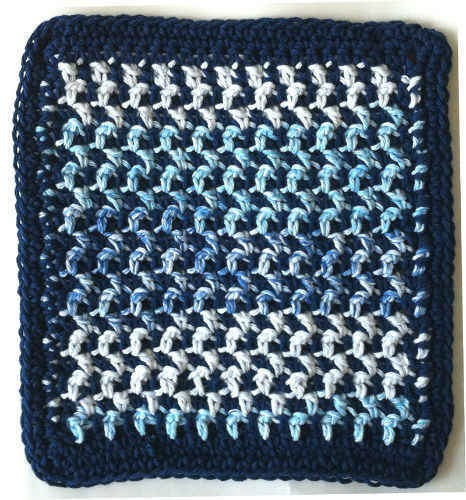 Row 1: Using 6mm hook and B, leaving 5” (13 cm) length, working in every other yarn loop, ch 148, turn. Row 2: Slip st in 2nd ch from hook and in each remaining ch across. Fasten off. Using A, wrap wreath tightly and evenly. Secure ends on back of Wreath. With 2.75mm hook and 2 strands C held together, ch 4, join with slip st in first ch to form ring. Round 1: Ch 3 (counts as first dc), work 11 dc in ring, join with slip st in top of beginning ch-3—12 dc. Round 2: Ch 5, dc in next dc, ch 2, *dc in next dc, ch 2, repeat from * around, join with slip st in 3rd ch of beginning ch-5. Round 3: Ch 6, dc in next dc, ch 3, *dc in next dc, ch 3, repeat from * around, join with slip st in 3rd ch of beginning ch-6. Round 4: Ch 9, tr in next dc, ch 5, *tr in next dc, ch 5, repeat from * around, join with slip st in 4th ch of beginning ch-9. Round 5: Ch 11, tr in next tr, ch 7, *tr in next tr, ch 7, repeat from * around, join with slip st in 4th ch of beginning ch-7. Round 6: *Ch 20, slip st in 2nd ch from hook and each remaining ch, slip st in next 7 chs on previous round, slip st in next tr, repeat from * around, join with slip st in first slip st.
With A and 3.75mm hook, ch 2. Round 1: 6 sc in 2nd ch from hook—6 sc. Round 2: 2 sc in each sc around—12 sc. next sc,* repeat between * 4 times, sc in next 2 sc, repeat between * 4 times. Round 4: Working in back loops of round 2, [sc2tog in next 2 sc] around—6 sc. Fasten off. Round 2: [Sc in next 2 sc, 2 sc in next sc] around—8 sc. Round 3: Sc in each sc around. Leaving long end, fasten off. Using long end, gather sts and sew Head to Body as shown in photo. With C Embroider eyes using french knots. Cut one 9” (22 cm) diameter circle from each sheet of Phoomph. Place fabric right side down on a hard surface. Remove paper from one side of one circle of Phoomph. Center Phoomph circle exposed side down over fabric and apply pressure to adhere Phoomph to fabric. Remove paper from opposite side of Phoomph circle. Fold remaining material around Phoomph circle and apply pressure to adhere. Place Web on hard surface and center covered circle over Web. Pull long ends of Web to back of circle and apply pressure to adhere to unused area of Phoomph. Remove paper from one side of remaining circle of Phoomph. With exposed side down, center over fabric-covered circle and apply pressure to adhere circles together. Do not remove the paper from the remaining side. Place circles at back of Wreath and adhere to Wreath using glue gun. Placing slip st side of ruffle against Wreath, glue ruffle around back of Wreath close to edge of Phoomph. With 2.75mm hook and 2 strands of C held together, ch 38. Fasten off. Join ch to spider and secure to back of Wreath. With 3.75mm hook and A, ch 20, join with slip st in first ch, slip st in each remaining ch around. Leaving long end, fasten off. Using long end, sew Hanging Loop securely to top of Wreath.